A celebration of the energy, emotion, and expression of the creative mind is found throughout 1001 South State. In commemoration of innovation and community, we joined Columbia College’s Wabash Arts Corridor Initiative and added a forward-thinking new piece to the neighborhood’s robust collection of street art. In 2016, we commissioned local Chicago artist and Columbia alumna Justus Roe to paint the vibrant mural found on the south side of our building. Roe’s improvised style lives somewhere between traditional abstract art and wild style graffiti. We expanded our artistic endeavors in 2018 with the addition of an indoor mural from Columbia College alumna Melanie Vazquez. Her stunning surrealist piece brings a beautiful energy to our community’s dog run, where residents can relax as they play and exercise with their pets. 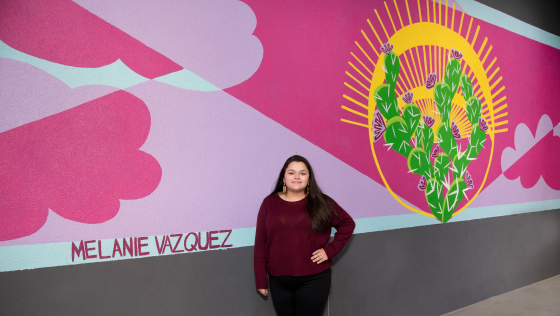 Vasquez’s one-of-kind mural embodies her desire to bring awareness to culture and diversity. Get a first look at Roe and Vasquez’s work in the video and photograph below.